This is just a simple translator that you can use to convert text to Wingdings, or Wingdings to text. If you'd like to find what some wingdings mean, paste it in the left box. If you'd like to turn text into the Wingdings font, paste it into the right box. Note: I recently fixed it to prevent some of the characters from rendering as emojis. Wingdings is series of symbols implemented by Microsoft in the 1990s. These symbols were packaged into a font so they could easily be used in word processors. So when you type a letter on your keyboard, a Wingdings symbol appears instead. 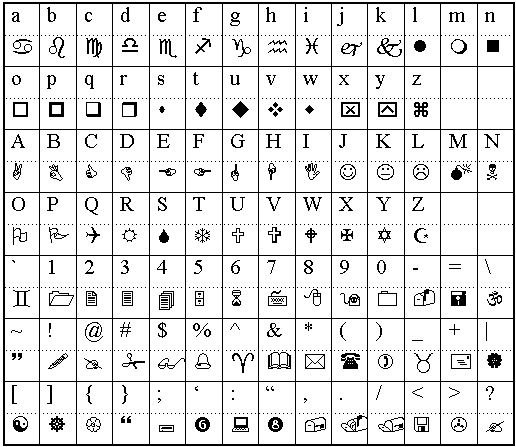 Wingdings is known as a "dingbat" font because ornamental symbols called dingbats were often used by early printers for asthetic purposes. Usually, if you try to copy and paste Wingdings, you wont actually be able to paste the Wingdings symbols anywhere - you'll just end up pasting the actual keyboard characters that you typed. This translator allows you to actually copy and paste the Wingdings symbols from the box on the right. How does it work? Well, it's all thanks to our friend Unicode. Unicode is a computing industry standard which standardises thousands of symbols, letters and characters across a large portion of the relevant parts of the computing industry. A large part of the computing industry is web browsers, and, happily, they have incorporated many of the 120,000+ unicode symbols into their software. The Unicode Consortium, has now included all of the original Wingdings symbols into the standard, allowing us to actually output unicode symbols in the right-hand box, which can be copied and pasted anywhere where unicode symbols are supported. Note that even though Unicode has included all the original Wingding characters, this doesn't mean that your web browser has fully implemented them yet, so some symbols may not work. P.S. If you're here to generate wingdings translations for WD Gaster's language from Undertale, then make sure you use capital letters! Also, you might also be interested in Facebook emojis - that's a massive searchable list of all the emojis that you can use in your Facebook posts and chat. And I made an 🐌 Emoji Translator 🎲 which you might like to check out. Finally, I made a Text Symbols translator which includes a massive list of emojis which you can copy and paste.